Airbnb was a total bust for us while travelling around Europe. 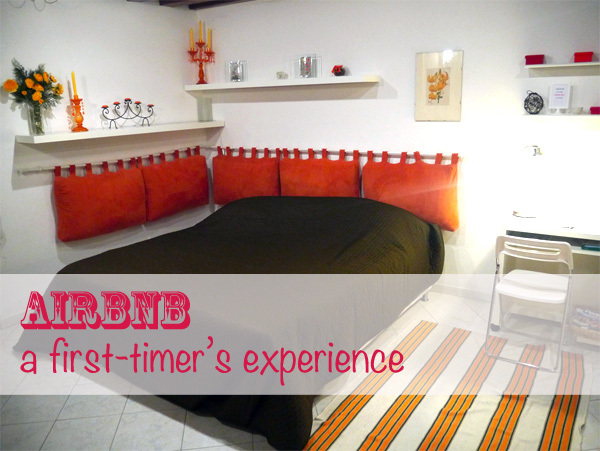 We never found any good deals, plus the hassle of going back and forth liaising with hosts, when we were travelling on the fly, meant our first Airbnb experience didn’t take place until right at the end of our Eurotrip. We found an apartment in Paris, quickly followed by another two in New York. Paris and New York are both crazy expensive (a friend reckoned he spent $30 for a dorm in NYC last year; this year the cheapest start at $50 a bed), and even staying in hostels would have blown our budget. As it turned out, we had firm dates for both cities, and were able to lock in rooms at much lower prices than we could have found on the commercial market. It was the first time for both of us – them as hosts and us as guests. Their spotless apartment was on the outskirts of the 15th arondissement, but close to shops, supermarkets, the metro, and the tram. With candles burning and freshly scented air, it was a million times better than any hotel. And despite a wee hiccup with a delayed arrival time and a bit of a language barrier, I think we got along fairly well. They took us to a free outdoors concert one night and shared homemade crepes on the weekend. I was expecting a preppy, bright eyed 20-something actor based on his Airbnb profile. He turned out to be more of an overgrown teenager in his 30s, though he didn’t look any older than us. And what an introduction to New York! We talked food, movies, politics, culture, and so much more. The Williamsburg apartment, while cramped, was a steal, literally a minute from the subway, the supermarket, and above a number of (amazing AND cheap) delis and fast food places. The only downside was the train tracks right outside the window, but we quickly learned to tune out the noise. Strike one: It was way further from the subway stop than I thought (a brisk 10-12 minute walk, a leisurely 20-minute stroll). Strike two: The place was falling apart, with gouges out of the walls, peeling paint, a funky smell … by the time we got to the top floor, I was secretly wondering what I’d gotten us into. Strike three: We couldn’t get in, and had to call the host. Turns out they’d given us the front door key and our room key, but forgotten about the apartment front door key. Luckily, I’d gone with the room in the building that the hosts lived in, and not a room in one of the other buildings that they had listed on Airbnb. Once we got inside though, it was surprisingly nice – roomy, clean, and quiet. We rented one room in a three-bed apartment; the other two were rented separately to other Airbnbers. (I imagine this is way more lucrative than letting the apartment to a normal tenant; I feel a little guilty, since this is probably contributing to the terrible property market in NYC and making it even more impossible for locals to find a place to live.) There was the occasional wait for the bathroom, but otherwise it was all smooth sailing and we hardly saw any of the other guests. Being a bit further from the metro was less convenient, but it was nice to see a slice of quiet suburbia in New York. The only time it was a real headache was on Saturday night, when we stayed out late and had to navigate the maze of cancelled/rerouted trains on the way back (we ended up walking a very long way from a distant stop). Now that I’ve had the opportunity to use Airbnb and actually find a bargain, I’m pretty sold. My initial suspicions are confirmed: Airbnb is best for trips where you have set dates and can book in advance – and most likely for trips to crazy expensive cities. Traveling anytime soon? Consider a yacht charter! For an excellent source of boat and yacht charters and cruises: go here. We used Airbnb in Washington, DC and really liked the experience. If we go to another big city with a good transportation system, we will definitely use it. Our hosts in Paris were very concerned as apparently this is against the rules (apartment building rules? city rules? not sure). Pretty sure our NYC hosts were not worried but did not ask (and didn’t even see our second hosts for more than 30 seconds). I never used Airbnb, but the concept sounds very interesting. We used Airbnb when we went to Miami a few years ago. It went very well! It definitely takes a while to set up a stay on AirBnB because the hosts don’t do this full-time. That’s the only thing about AirBnB that I really hate. Other than that, it’s great. Friendly locals, kitchen, cheap rates…I love it. I’ve used Airbnb as a guest in Seville, Spain and in San Luis Obispo, California. Both were very good experiences and not a hassle to set up. I had firm dates for both trips and was able to get responses from hosts within a day. Considering that there were time zone issues, I thought the lack of immediate response was fine. I just started hosting through Airbnb last week. I created a profile about three weeks ago with my own photos, but took them up on their offer to have a professional photographer come in and take much better photos for free. Within days of having the profile updated with new photos I had my first booking. That experience went very well with a considerate, neat guest who stayed for two nights. Yesterday I got a message through the Airbnb app requesting a stay the same night from a woman who’s accommodations fell through at the last minute. I was able to accept with no problem and am hosting my second guest now! Airbnb tries to make it very easy for guests and hosts to connect with a mobile app and an ability to tie in your message box with your text number. As long as you have a smart phone and keep the, it’s super easy to be a host and clean up the room as soon as a guest leaves, it’s a piece of cake to be a host. I definitely want to Airbnb once we buy a house! Way better IMO than having permanent flatmates. I love AirBnB and generally had great experiences with it, but I would check your homeowner insurance policy – if your AirBnB guest gets injured in your house and sues you, you might not get covered because you are using your home for commercial purposes. Haha, you basically described the perks and downsides of every apartment in those respective New York neighborhoods. Williamsburg is always near cheap things and subways. Astoria is always ridiculously non-New Yorky and always old and falling apart and never anywhere near a subway. They like literally don’t have any apartments near the trains. It’s the stupidest borough ever. I bet the Williamsburg one cost you more money though, yes? Also, it’s technically against most leases to sublet your apartment, which means it was probably illegal for your hosts to even be on AirBnB. My friend does it and when his super found out, he basically said “start doing my repairs or I’m kicking you out.” So now my friend has to work for the money, in a way. It’s insanely lucrative though, you’re right, which is why my friend didn’t just stop doing it. No! The Williamsburg one cost less (it was crazy super cheap, worked out to be like $54 a night including the Airbnb fees) and Astoria was about $60. In his profile the Brooklyn dude said something along the lines of ‘this low price is my gift to you as a visitor’ though. I stayed in about a half a dozen AirBnBs and have a pretty good success rate. I generally choose AirBnB over a hotel even if a hotel has a comparative rates because I like having a kitchen which allows me to cook while I travel; I’ve saved a few good pennies eating in on the road! 2 for 3 isn’t bad, and it sounds like the last one wasn’t terrible. We’ve arranged things on Craigslist in New York in the past, but I imagine most vacation rentals are now on Airbnb! Might have to try this next time I have the occasion to. I have yet to use AirBNB, which is probably a result of never traveling to big cities unless it’s for work. My vacations tend to center around tiny, remote towns with cheap lodging 😉 I don’t know if this will change as I get older, but city travel rarely appeals to me! We used Airbnb on our last trip to NY and it worked out great – we had set dates etc though. We chose a whole apartment – not particularly cheap, but still cheaper than our hotel choices – and it definitely reduced our food spending. I would use them again, but the key issues when locking up and leaving (the key would not work!) did cause me to have a mini panic! I had a fantastic experience my first time using Airbnb for Boston and will definitely use this in the future. Previous post: Couchsurfing vs Hospitality Club vs Staydu vs Global Freeloaders – what’s the best hospitality exchange site? Next post: Travel essentials: What to pack and what to leave behind?